Secretary of State says during visit to Jerusalem: Sadly, we have seen anti-Semitic language even in the great halls of our own capital. US Secretary of State Mike Pompeo on Wednesday issued a thinly veiled jab at US Democrats over anti-Semitism, following the controversial comments by Muslim congresswoman Ilhan Omar (D-MN) over American support for Israel. 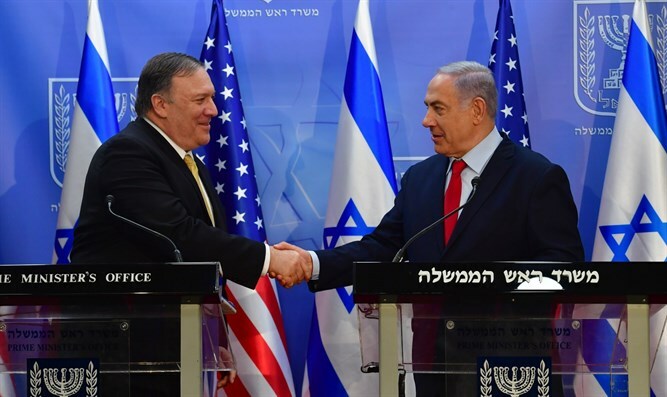 Speaking on Wednesday during his meeting in Jerusalem with Prime Minister Binyamin Netanyahu, Pompeo said, "All nations, especially those in the West, must go to the barricades against bigotry." "Sadly, we in the United States have seen anti-Semitic language even in the great halls of our own capital," he added. Omar’s controversial remarks led the Democrats in the House of Representatives to work on a new resolution condemning anti-Semitism. However, the resolution was watered down to include condemnation of all forms of bigotry after objections from some Democrats. The watered-down version was ultimately approved by an overwhelming majority. Following the approval of the resolution, President Donald Trump ripped the Democrats, telling reporters that the Democratic party has become an “anti-Israel” and “anti-Jewish” party.